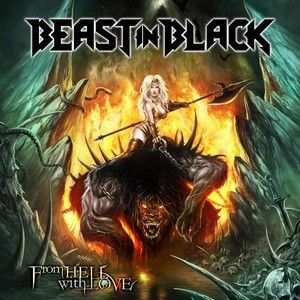 "With its improbable cocktail made of dance, synthetic and heavy metal, Beast In Black continues his journey with ease and seems on its way to make a big hit." "Anton Kabanen's return from revenge" could be the subtitle for Beast In Black's new album. After a successful first try, the band is back with "From Hell With Love". For his first draft, Beast In Black had shaken up his world with a catchy heavy melody tinged with dance and pop sounds for an explosive result. The cocktail is still improbable and undeniably cheeky. On several occasions, Beast In Black offers an strange mixture to shake up pure and hard metal fans. 'From Hell With Love' with its dance side evokes the boy bands of the 90s and in particular Backstreets Boys with a typical chorus and a frantic dancing rhythm. 'Sweet True Lies' also surprises, close to a sweet pop like Britney Spears with a catchy chorus and a dancing rhythm. There is also 'Die By The Blade' and 'True Believer' which look back to the 80s and that synthetic keyboard sound that marked the era. The whole thing is carried by a stunning Yannis with its pure and even feminine tone. Let the most obtuse be reassured, there is still a good dose of heavy power with a certain sense of the catchy melody. "Repentless", "Unlimited Sin" and "This Is War" are grand epic heavy wonders worthy of Sabaton with fire solos and warrior choirs. Yannis is impressive. It changes from a soft to a high tone with disconcerting ease. More powerful and just as catchy, 'Cry Out For A Hero' and 'No Surrender' are dynamic in the spirit of a Judas Priest and make you want to headbang. Finally, with the ballad "Oceandeep", the band goes towards folk horizons that Nightwish would not deny. "From Hell With Love" is a fresh and cheerful album. Of course it requires a broad open-mindedness but it is worth it. It is a guilty little pleasure that encourages you to move frantically. Beast In Black continues his journey with ease by heading straight ahead and seems well on its way to make a big hit.